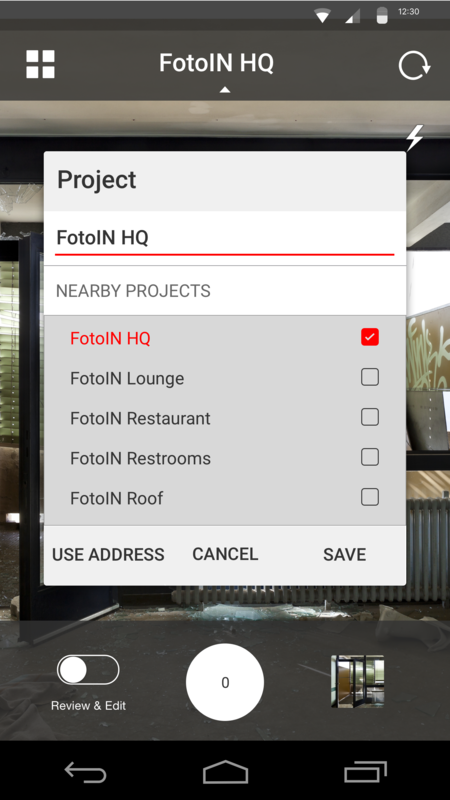 Opening the FotoIN app will take you straight into capture mode. 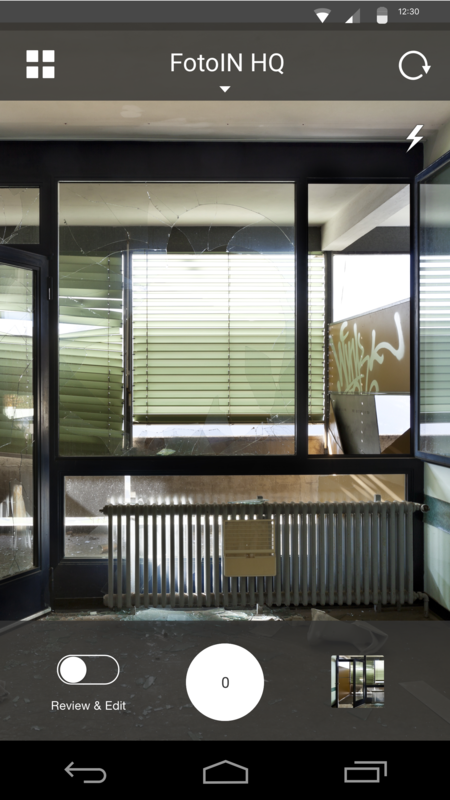 TIP: Make sure location services are always turned on. To capture a photo, tap the white capture button. If there are required tags associated with the project, a tag menu will pop open after snapping the first photo. ‘Review & Edit’ is turned off by default so you can take many photos in a row. To edit the last photo, tap on the thumbnail in the bottom right. To snap and edit photos one by one, turn on Review & Edit. After you snap the next photo, you will be taken to the edit screen to add tags, comments and annotations. TIP: Leave Review & Edit turned off so you can take more photos in less time. 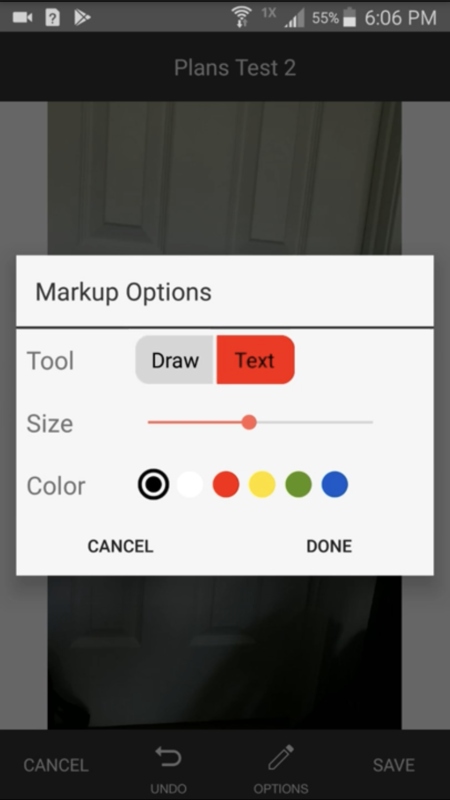 To markup a photo: tap the mark up icon and the markings toolbar will appear. By default, the tool is set to draw mode. Use your finger to draw anywhere on the photo. Tap on the Options button to change the pencil color, size or to type on the photo instead. With the Text tool option, you will notice when typing an opaque background behind the letters. This means the text is still editable. You can drag it around and even tap on the Options button again to adjust the size and color. Once you tap outside of the text area, it will no longer be in edit mode. Tap Undo to remove your last markup. Tapping Save will burn the markups into the photo. To add comments: tap the comment icon to open the comments box and begin typing in comments or keywords. To tag photos: tap the tag icon and select the tag values you would like to apply. 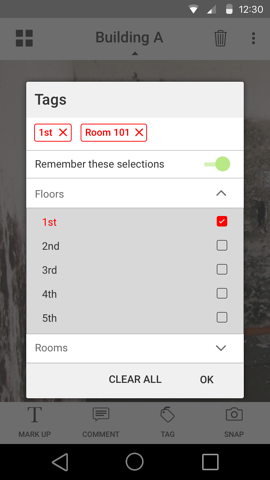 You can delete applied tags by tapping selected value(s) or tap Clear All. To annotate photos: tap anywhere on the photo. 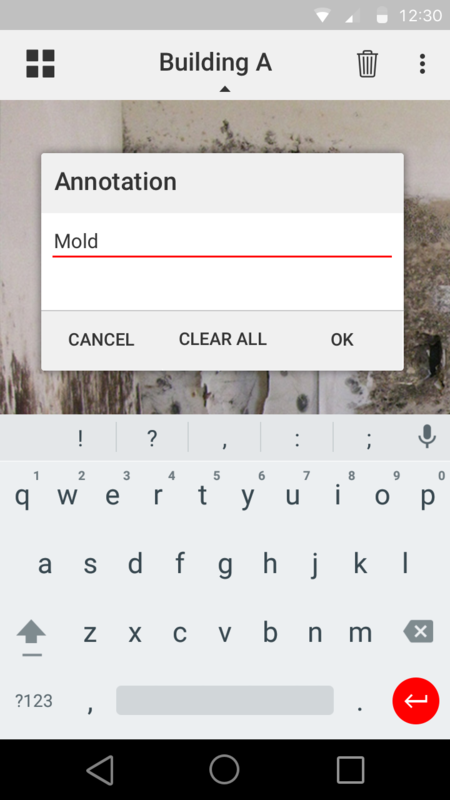 Hold down on an annotation and drag to move it, or double tap it to edit or delete it. 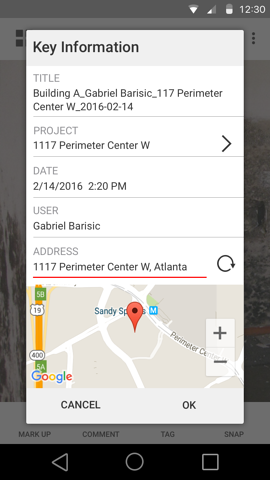 To view/edit key information: tap the photo title to view title, project, date, user, address and a map location. Here you can also update the selected project. To delete the photo: tap on the trash can icon to delete the photo from your mobile app. To share the photo: tap on the menu icon (three dots in upper right corner) to select ‘Export to PDF’ or ‘Email Photo’. TIP: Tag the first photo and tag values will be applied to all subsequent photos.